When Father Thomas Higgins celebrated Mass at Holy Innocents Church for Catholic Schools Week on Monday, Jan. 29 he celebrated for the students and faculty of three schools — his own at Holy Innocents School and also Archbishop Ryan School for the Deaf and St. Lucy School for Children with Visual Impairments. The latter two are just around the corner and join in a unique partnership with Holy Innocents School in North Philadelphia. Under the arrangement that began in 2006, most of the students at St. Lucy and Archbishop Ryan, with accommodations for their special needs, attend some of their classes at Holy Innocents and are integrated as much as possible into the school. 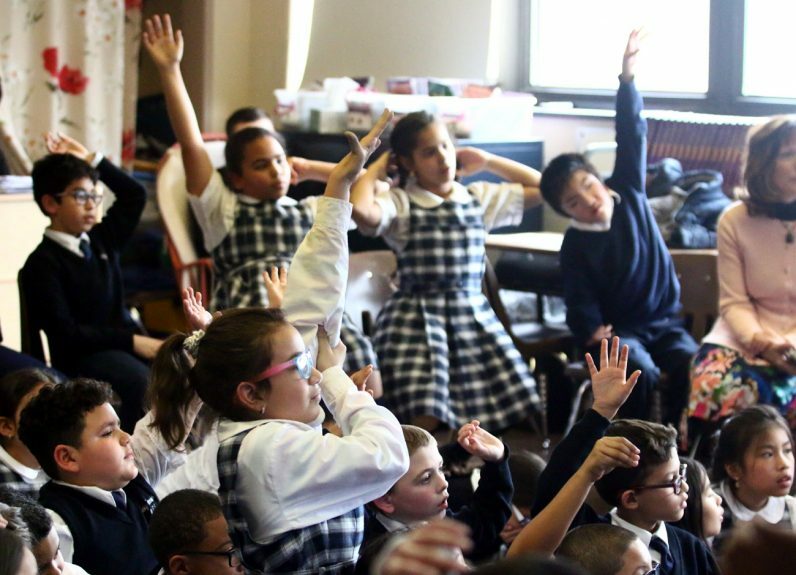 Archbishop Ryan School for the Deaf, founded in 1912, at this point has 10 children it its program and St. Lucy, founded in 1955, has 28 students, according to Immaculate Heart of Mary Sister Lisa Lettiere, who is principal at both schools. Because elementary school teaching mostly relies on students hearing the instruction rather than seeing, St. Lucy was able to mainstream students as much as possible since its foundation. Mainstreaming is much more recent for the Archbishop Ryan deaf students. In their own program, Sister Lisa explained blind students learn to read and write in Braille and deaf students learn to use American Sign Language (ASL) as well as spoken English, which is important because ASL uses many shortcuts that would not be used in writing. Generally speaking, students from either St. Lucy or Archbishop Ryan are not mainstreamed immediately, but at a time when their school feels they are ready for it. When the students go to Holy Innocents support staff are there to interpret any verbal instructions into ASL for the deaf. Explanatory comments for visual programs, perhaps a film or PowerPoint presentation, are provided for the blind students. “We generally keep visually impaired students in our building for reading, Braille instruction and for math,” Sister Lisa said. “The math in Braille is difficult. The hearing impaired stay in our building for language development and writing. But the mainstreaming is important, Sister Lisa believes. It gives all of the kids an opportunity to experience other peers who may not have their disability or no disability, and at the same time befriend other students like themselves. Pat Pomroy is the guardian of two grandchildren who are profoundly deaf. They come to Archbishop Ryan from Croydon in Bucks County. Robert, who is in fifth grade, has been mainstreamed in one of his classes. Rachel, who is in second grade, is not yet at that point. Natalie Wallace has a visually impaired son, Ben, in seventh grade at St. Lucy. He went to public school until second grade, but his mother found he could not participate in many activities. It was Ben himself who came across St. Lucy through audio-enabled internet. Although they live in Norristown his mother enrolled him. “It’s an hour drive but it is the best thing we ever did,” she said. “He doesn’t care about the distance. The first year all his classes were at St. Lucy, the next year he went to Holy Innocents for one class and now he goes for religion, science and social studies. Now Ben has classes with kids who have no disabilities or have hearing or sight impairment and he is perfectly happy about that. In sum, it’s a win-win, according to Sister Regina, because the children of her school also have a better understanding and appreciation for children with special needs.